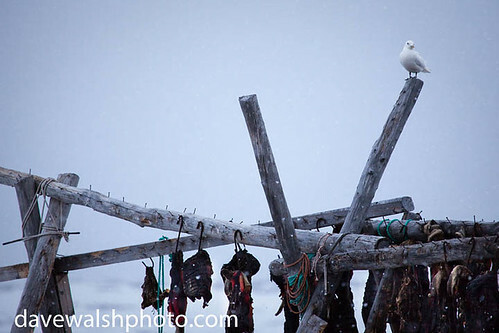 Ivory Gull perched above seal meat, originally uploaded by Dave Walsh Photography. Ivory gull, pagophila eburnea, perched above a rack of dried seal meat at the dog yard, Ny-Alesund, Spitsbergen, Svalbard, Norway. Populations are currently in decline throughout the Arctic, possibly because of decreasing sea ice, and the PCBs and DDE found in the food they eat, for instance seal carrion from polar bear kills.